The inimitable Tommy Lawlor beat me to my story today, as he artfully deconstructed the Andy Reid-Joe Banner relationship better than I could, pointing out some places where the conventional wisdom is often the product of so much wishful thinking on behalf of the media. 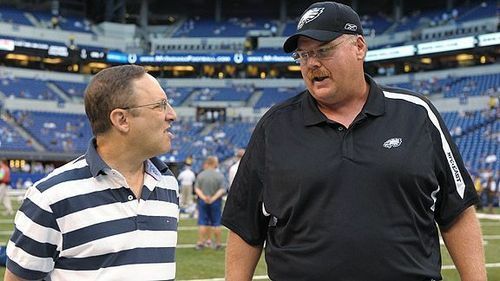 When Eagles general manager Tom Heckert, Reid’s righthand man for nine years on player personnel issues, left for the same job in Cleveland, and Howie Roseman, Banner’s protege, became GM, it created an appearance that Banner had usurped Reid. Of course when you actually examine the switch, the theory doesn’t quite stand up as well. Heckert was always going to be second fiddle to Reid in Philadelphia. He was always going to be in Andy’s shadow (figuratively and physically) when it came to getting respect for building winning teams. Mike Holmgren may be in Cleveland, but as Team President he likely won’t be involved in all of the personnel decisions. Heckert has a chance to prove himself; it isn’t “the same job” at all. But at the end of the day, of course Banner is, in some respect, “the boss.” Along with owner Jeff Lurie, he hired Reid. I imagine he has some sort of power (with Lurie’s permission) to fire him. However, that doesn’t mean things are that simple. For one, Banner is a smart man. He knows what he’s good at — allocating cap space and crafting player deals. And he knows what he has no experience in — football decisions. Even if Banner had complete control over Andy, it would still be smart to delegate all things not related to money. There are two things which back this up. First, Andy hasn’t left Philadelphia. It’s not like anything’s tying him to this city. His kids are older. He’s been around the country and back again as a coach. And he’s demonstrated that he can create winning teams. If Banner was taking away his power as “football decider” (a role Andy fought to have), Reid wouldn’t have to stick around and take it. Half the teams in the NFL would jump at a chance to have him. And, from Banner’s perspective, what do you gain by exerting more say over the team? The partnership has worked for years without problems or major disagreements. They have the wins to show for it. Even the Donovan McNabb trade — perhaps the single biggest decision made by the Eagles in years — went down without as much as a hitch. Does Banner want to go back to finding a new coach who almost certainly won’t be as good as Reid, let alone as compatible? Sometimes when everyone says the same thing, it isn’t because everyone’s lying and there’s some nefarious backroom plot going on to keep the whole operation from falling apart. Sometimes it’s just because the truth is that easy. Reid and Banner have maintained a succesful partnership for eleven years. Let’s stop trying to invent reasons to think otherwise. Tagged with Andy Reid, Joe Banner, Philadelphia Eagles, Front Office, Relationship, Tom Heckert, Howei Roseman, Jeffrey Lurie, Partnership, Winning, Tommy Lawlor. July 19, 2010 by Brian Solomon.